This holiday season was marked by the release of a unique new book: The Common Book of Witchcraft and Wicca. 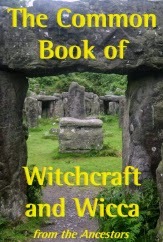 The book, dealing with magic and spirituality for the modern Witch, is highly unusual not only in being offered free of charge but also in being published under a creative commons license that allows people to share and republish its contents without having to worry about copyright issues. The book is available as a free pdf download directly at http://goo.gl/9L9HdT or through the publisher's site at http://bit.ly/tcbowaw. Authors featured in the Common Book include Pagan luminaries such as Oberon Zell-Ravenheart of the Church of All Worlds and the Grey School of Wizardry, Rev. Don Lewis of the Correllian Nativist Tradition of Wicca, Abby Willowroot of Spiral Goddess Grove, Raven Digitalis, Arch Priestess Stephanie Leon Neal, Alan Salmi, and A. C. Fisher-Aldag, among others. I have downloaded a pdf of the book for myself, but not had a chance to read it yet. I'm looking forward to doing so though.